The winter days are in, and you expect your furnace to keep you cozy and warm all throughout the season. But if your unit starts blowing water, it can compromise your comfort when not addressed immediately. 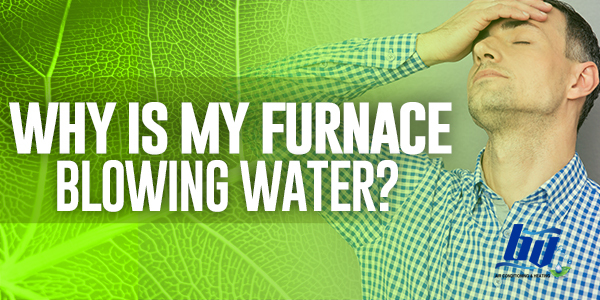 So what’s the problem with your furnace blowing water? Find out here and now. If your furnace is bowing hot air, and then cold air, and suddenly stops bowing air at all, then you can put the blame to overheating. When this happens, the limit switch will turn the burners off automatically. The blower will then cool the heating system to a safe level. The reason why furnace overheats is a clogged air filter. Be sure to replace your filer regularly to keep your unit working properly. The thermostat’s fan is set to ON. When you notice your furnace blowing water, you don’t have to panic and call a pro right away. You can do a simple DIY fix like checking the thermostat. Check if the thermostat is set to ON. If yes, then the blower constantly operates even when the system is actually heating the air. An easy solution is to set the fan to AUTO. The pilot may be out. Another reason why a furnace blows water is when the pilot goes out. First, relight the unit. If the flame stays lit, great! But if not, check if the gas valve is set to ON mode. If it is, what you can do is to clean the pilot light. If the light stays on for just a while, chances are the thermocouple needs repair or adjustment. If you’re uncertain, hire a professional technician to address the problem. When your furnace is blowing water, calling a local contractor is not actually the first resort. You can try simple DIY fixes. But if unable to solve the problem, that’s the time you need help from the professionals at BV Air Conditioning & Heating.